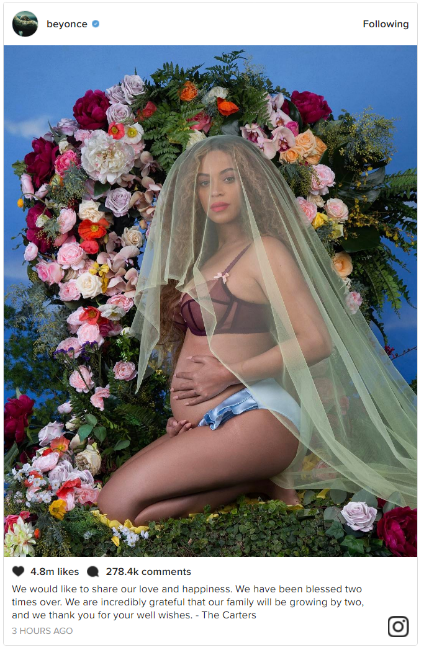 Beyonce’s Having Twins and 2017 Is Suddenly Looking Up! -Leave it to Beyonce to save our souls. This might be the best birth announcement in the history of ever. The pose! The forest nymph theme! The veil! Even more incredibly, it made Twitter a happy place again. She works miracles. -In other multiple birth news, Pharrell Williams and his wife welcomed triplets. –Johnny Depp‘s ex-managers have fired back with a countersuit, alleging that actor’s extravagant spending is the real cause of his money problems. They claim he spends $30,000 a month on wine and dropped over $3 million to blast the ashes of author Hunter S Thompson from a specially made cannon. –Drake, Kanye West and Justin Bieber are all skipping the Grammys. –Salma Hayek claims her words to Jessica Williams were somehow taken out of context and she wasn’t being dismissive — even though Williams has said she felt like she was being dismissed. Which means she’s immediately gone on the defensive instead of trying to understand and learn and amplify other voices, which is what intersectional feminism is built on. Swell. –Norman Reedus and Andrew Lincoln just admitted that they didn’t much care for the first half of The Walking Dead’s current season either. -On the plus side, Ryan Murphy‘s Feud is getting good reviews, as is FX’s new show Legion. –Denis Villeneuve is officially set to direct the Dune reboot. Yay, I guess? -This oral history of Crash’s Oscar win is actually pretty good. Michael Pena remembers not being a big enough star to get invited to the ceremony, while Brendan Fraser says he was shooting a film in Mexico with Sarah Michelle Gellar and she got him a mariachi band to celebrate. -Every time an Oscar voter explains their thought process, I wonder how anything good ever manages to gets nominated. –Melissa McCarthy‘s new Super Bowl ad features her getting attacked by a giant whale which is literally MY WORST NIGHTMARE. -There’s the first trailer for Claws, a new TV show produced by Rashida Jones. I’m digging the premise.